This armchair consists of a satinwood concave shaped back in the form of a shield, this being a typical Georgian style, with finely painted Classical decoration of an urn to the top, central oval panel with vase of flowers, draping fabric and foliate designs with painted lattice and floral edge, the back also with painted floral and foliate designs. The shaped arms of shepherd crook design also painted with a floral and foliate decoration leading down to the oval upholstered seat finished in a neutral fabric (this could be changed once purchased to a fabric of choice), the oval seat rail painted with lattice and floral decoration. 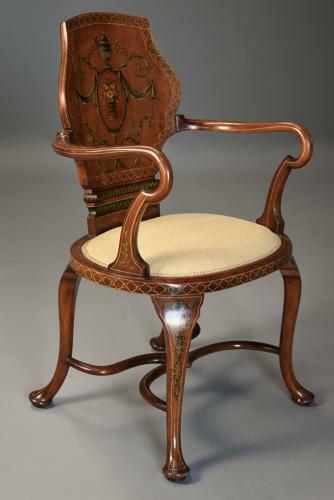 The chair is supported by four foliate painted cabriole legs leading down to pad feet, all joined by an elaborately formed stretcher.